Emida attended the Mondo business training as next of kin for her sister Anne. Anne started an egg and chips café. The business did well, but Anne sadly passed away in 2014. Emida took over the business, which has gone from strength to strength. The cafe is ideally situated next to a local bar and so gets plenty of custom. In March 2015 she received a loan which has helped her to expand the cafe, buying more equipment and installing electricity. She now employs an assistant to help prepare the food. 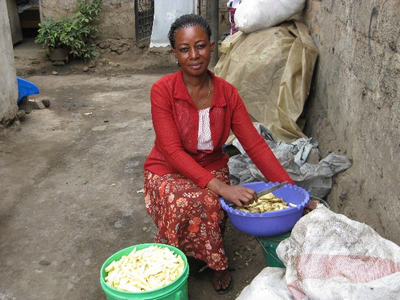 With the profits from her café she has built a chicken coop and poultry and made improvements to her house. She also succeeded in paying school fees for both her own and her late sister’s children. If you would like to help support more women like Emida, we are currently raising funds for our next round of grants and loans. To help us achieve our target you can donate here.